If you are looking for information on the Mountain Mudd franchise business opportunity, Mountain Mudd Espresso franchises or Mountain Mudd coffee franchising, then you have come to the right place. 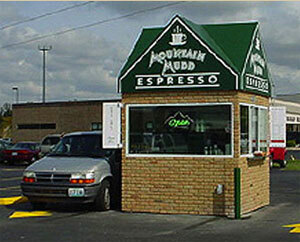 If you're looking for a business with well-demonstrated demand, owning a Mountain Mudd drive-thru coffee kiosk franchise may be the ideal opportunity for you. Our kiosks offer customers a quick, convenient way to satisfy their caffeine cravings. Unlike traditional coffee shops, with a Mountain Mudd franchise, you'll be able to serve more customers at a faster pace, while keeping costs low and owning a business in the billion dollar specialty coffee industry. Since 1994 our kiosks have been keeping customers caffeinated; we are currently expanding and are looking for select individuals to join us. Coffee accounts for 75% of all the caffeine consumed in the U.S. and is the number one beverage choice. Many busy consumers are often in need of a cup of coffee to get them through the day. Time is of the essence in their chaotic lives and our drive-thru model saves them time. Our customers don't have to drive around looking for a parking spot and stand in line inside a café, they simply pull up to our kiosk and are on their way. This convenience has made drive-thru coffee the fastest growing segment of the specialty coffee industry with 53% of customers getting their coffee "to go". A Small Business with Big Perks! Your kiosk will be located in a prime location to increase traffic to your business. One 8'x8' Mountain Mudd kiosk fits into a parking space. Partnering with convenience stores and other businesses provides a unique opportunity for them to expand their retail offerings and ensures you will have an automatic, built-in audience for your business. You'll enjoy operating an efficient, low-overhead business with low labor and real estate costs. We at Mountain Mudd believe that our no-nonsense, proven business model, first-class training and support, and the highest quality products and recipes, trademarks, logos, and group discount pricing provide a solid foundation to start your new business and deliver results. 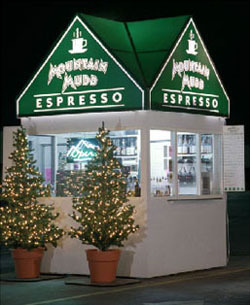 Moutain Mudd Kiosk with a dark green roof canopy that attracts attention and differentiates you from the competition. Initial training at the University of Mudd where you'll participate in hands-on and classroom training that covers the preparation of gourmet beverages, staff hiring and training, marketing principles, and the development of a menu that satisfies your customers. Ongoing training program for you and your employees at your site upon installation of your kiosk. Expert guidance in site selection, lease negotiation, permitting and licensing, and industry-leading efficiencies to utilize inside your kiosk. Marketing and advertising materials to help you promote and grow your business. Protected territory to ensure you'll be the only coffee seller in your predetermined geographic area and help you maximize your sales. We assist and support you every step of the way as you open and operate your Mountain Mudd kiosk.